Show Desktop is a small macOS application that will hide all applications for an unobstructed view of your desktop. It can run in the menu bar or the Dock. The right-click menu shows all applications for quick access. Lastly, it can be configured for precise control over what you want shown or hidden. Preferences Configure Show Desktop to work exactly the way you want. 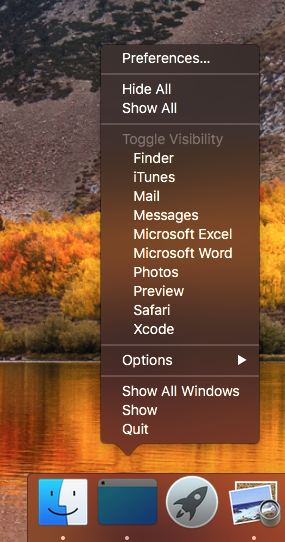 Dock Menu Toggle the visibility of any application from the Dock menu. Menu Bar Access Show Desktop can be displayed in the Dock or the menu bar (Show Desktop is on the left). 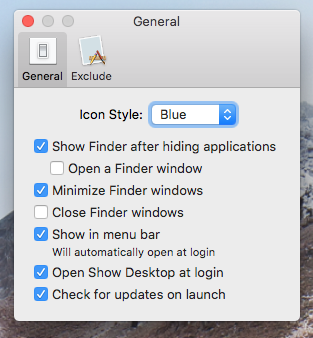 Show Desktop can minimize or close Finder windows to get them out of your way. 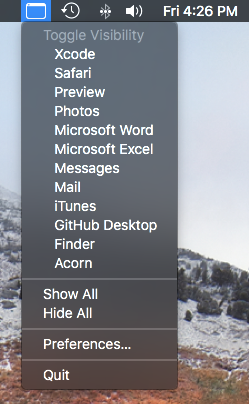 Show Desktop has an exclusion list so if you don't want your favorite applications hidden, just add it to the list. Show Desktop has 4 different icon styles to better fit the look of your desktop. And best of all, Show Desktop has no limitations. View Show Desktop's version history. System requirements : Mac OS 10.12 or higher.